Away from the political alignment in the axes of the confrontation in the region and the world, it is possible to stop in front of what has happened in Riyadh summit with respect to characterization and analysis to discover the new things which were given by the conference held in Riyadh under the title of US-Islamic-Arab partnership, and to discover the extent of the conformity of the announced goals with what is revealed by the positions of those who hold this assembled festival, and then estimating what is wanted by the Saudi and the American depending on the main answers of the main questions. No one in the light of the positions known by the parties and the expected goals of the conference, along with the wars which were ignited in the region can expect that the Palestinian cause and the ways of its solving be a central issue of the Arabs and the Muslims in the meeting with the country which forms the first source of funding, weapons, and the diplomatic protection to Israel, as it is not possible to expect that the condemnation of Iran and Hezbollah will not be one of the most prominent subjects of that conference, due to sole reasons that belong to both the American and the Saudi sponsors and for many other reasons between them. What is new is the move from condemning Iran as a country that is being beheld the responsibility of sponsoring local parties in the Gulf countries, and considering it an interference in the internal affairs of these countries, as well as the accusation of Hezbollah as Iran’s ally which is responsible for the main part of this task on its behalf, and the characterization of that with terrorism as an expression of the political negotiating escalation to a new stage in which the title of the war on terrorism becomes dedicated to Iran as a main goal and ISIS as a secondary goal, and where Hezbollah and Hamas Movement become equal to ISIS, with the exclusion of Al Nusra front and ISIS from the list which their mentioning is not possible to be inadvertent in such a discourse of each the Saudi King and the US President. According to the new discourses, the approach is no longer carried by considering the war on ISIS a priority as stated in the inaugural speech of the US President, but the objection of the expansion of the influence of each of Iran and Hezbollah under the slogan of this war, and the convergence with Israel is to stop these two influences separated or assembled. So every war on ISIS that does not coincide with a war on the Iranian influence not only on Hezbollah, but on the resistance movements is a wrong war, this is exactly the Israeli concept. The Palestinian cause and the sectarian attraction are no longer considered the crucial elements in feeding the terrorism in the incubating background, moreover, to consider those who are concerned of confronting or solving the Palestinian cause or ending the secretion strife are no longer accompanying conditions to measure the seriousness in the war on terrorism, while getting rid of the Palestinian cause as a burden that delays the alliance with Israel and igniting the wars and the sectarian strife as a source of mobilization against Iran and Hezbollah have become required conditions in the concept of the new war. Instead of strengthening the power for a negotiating situation with Iran in order to prevent the strife, and to get rid of the incubating background of ISIS and Al-Qaeda by claiming the defense of a doctrine against doctrine, the words of the Saudi Crown Crown Prince become understood about linking the conflict with Iran with the issue of the emergence of Imam Mahdi as a war with the doctrine which tries to smash its followers in Al Qatif and Al Awamiyya even if Al-Qaeda and ISIS become militias of the regime against some of its people. Does this mean that the American want a war on Iran? Surely, he does not want it, but he felt happy because the Gulf is preoccupied with it. 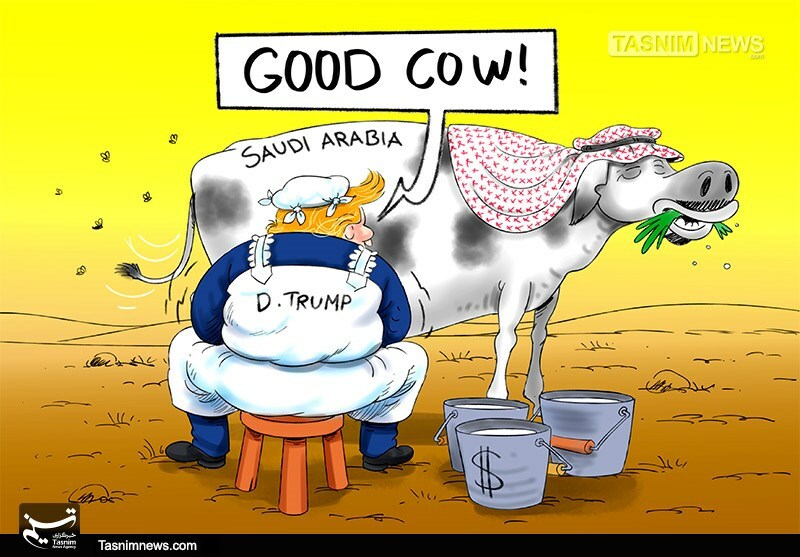 The startled Gulf is the milking cow which Donald Trump talked about in his electoral campaign; he has milked it with five billion dollars that will lead to the Kingdom’s bankruptcy. In the Gulf which is alert to sectarianism and the danger of the imminent strife, Washington’s negotiation gets intensified with Iran, Riyadh is alienated away from the engagement arenas with Tehran as Syria and Iraq, just be sufficient with welcoming the Saudi proposal about forming a reserve force to intervene in them, supported with thanking. The bankruptcy of Saudi Arabia does not bother Washington, the promised five hundred billion dollars for ten years equals medially fifty billion dollars annually, which means the increase of the budget figures in 2017 from 236 to 286 billion dollars, and raising the deficit from 53 to 103 billion dollars which means from 23% to 32 % and raising the debt from 83 billion dollars to 133 billion dollars, and gradually by adding annually to make it up to 800 billion dollars by the end of the ten years, which is equivalent to 100 % of the total expected national product then this means the bankruptcy. There is a way to provide the annual amount of fifty billion dollars for the transactions of Salman-Trump that is related to the intervention in the oil market, but the problem is the relation between the quantity of production and price. The increase of three million barrels per day to the Saudi production over the current ten million means the drop of the barrel price to fifty dollars and maybe less. The value of the additional three billions covers the amount of the required fifty billion at the price of fifty dollars per barrel, but the revenue of the ten million dollars becomes less than fifty billion dollars of the estimated current price which means seventy dollars per barrel, so the seeking to raise the price to hundred dollars per barrel requires to reduce the quantity to six and a half million barrels per day. Therefore the million and a half barrels becomes a sufficient source of income to provide the fifty billion dollars annually, but the value of the remaining five millions becomes less than fifty billion dollars annually comparing with what is estimated in the current year. Some Saudis suggested the discount of the Saudi annuity of the frozen deposits in America by the Americans, but the US response was the deposits were frozen under judiciary decision and can be considered a guarantee for payment only. The Saudi bankruptcy, drowning in strife and the civil war, raising the level of tension with Iran, and leaving Riyadh to Israel finally for a functional mission related to the Israeli concern from the Syrian variables are US goals that coincide with getting all the money to revive the stagnant US economy, and selling the plants which their US efficiency has ended as the US weapons which do not bother Israel, so what the neo-conservatives said about Saudi Arabia as a prize of satisfaction for their wars in Asia is a continuous ceiling for the coming years. – بعيداً عن الاصطفاف السياسي في محاور المواجهة الدائرة في المنطقة والعالم يمكن التوقف أمام ما جرى في قمة الرياض بقدر من التوصيف والتحليل لاستكشاف الجديد الذي حمله المؤتمر المنعقد في الرياض تحت عنوان شراكة أميركية إسلامية عربية، واستكشاف مدى تطابق المعلن من الأهداف مع ما تكشفه المواقف المتضمّنة فيه للقيّمين على هذا المهرجان الحاشد، وتالياً تقييم ما أراده منه صاحباه السعودي والأميركي بناء على الأجوبة الرئيسية التي تستدعيها الأسئلة الرئيسية. – لا يمكن لأحد في ظلّ المواقف المعروفة للأطراف والأهداف المتوقعة من المؤتمر ومع الحروب الدائرة في المنطقة أن يتوقع تصدّر القضية الفلسطينية وسبل حلها كقضية مركزية للعرب والمسلمين في لقاء قمة مع الدولة التي تشكل المصدر الأول للتمويل والسلاح والحماية الدبلوماسية لـ«إسرائيل». فهذا زمن أحلام مضى، كما لا يمكن لأحد أن يتوقع أن لا يشكل التنديد بإيران وحزب الله واحداً من أبرز محاور هذا المؤتمر، لأسباب منفردة تخصّ كلاً من الراعيين الأميركي والسعودي، ولأسباب أخرى تجمعهما. – الجديد هو الانتقال من التنديد بإيران بصفتها دولة يجري تحميلها مسؤولية رعاية أطراف محلية في دول الخليج، واعتباره تدخلاً في الشؤون الداخلية لهذه الدول، واتهام حزب الله من هذه الزاوية بصفته حليف إيران الذي يتولى الجزء الرئيسي من هذه المهمة نيابة عنها، والذهاب لتوصيف ذلك بالإرهاب كتعبير عن التصعيد السياسي التفاوضي، إلى مرحلة جديدة يصير فيها عنوان الحرب على الإرهاب مختصاً بإيران كهدف رئيسي، وبداعش كهدف ثانوي، ويصير حزب الله وحركة حماس مثيلين لداعش، وتُستثنى جبهة النصرة ويُستثنى تنظيم القاعدة من اللائحة التي لا يمكن ورودها سهواً هكذا في خطاب كلّ من الملك السعودي والرئيس الأميركي. – وفقاً للخطابَيْن الجديدين هو أنّ المقاربة لم تعد تجري من باب اعتبار الحرب على داعش أولوية كما ورد في الخطاب الانتخابي للرئيس الأميركي، لكن الاعتراض هو على توسّع النفوذ لكلّ من إيران وحزب الله تحت لواء هذه الحرب، والتلاقي مع «إسرائيل» يتمّ من زاوية العمل للحدّ من هذين النفوذين منفردين ومجتمعين، بل صارت كلّ حرب على داعش لا تتلازم مع حرب على النفوذ الإيراني واستطراداً ليس على حزب الله وحده، بل على حركات المقاومة هي حرب خاطئة، وهذا هو بالضبط المفهوم «الإسرائيلي». – لم يعد النظر للقضية الفلسطينية والاستقطاب المذهبي كعنصرين حاسمين في تغذية الإرهاب بالبيئة الحاضنة، واعتبار التصدّي للمهمّتين، حلّ القضية الفلسطينية وتجفيف مناخ الفتن المذهبية، شرطاً ملازماً لقياس الجدية في الحرب على الإرهاب، بل صار التخلص من القضية الفلسطينية كعبء يؤخر التحالف مع «إسرائيل»، وتفجير الحروب والفتن المذهبية كمصدر للتعبئة ضدّ إيران وحزب الله، شرطين مطلوبين بمفهوم الحرب الجديدة. – بدلاً من تعزيز القوة لوضع تفاوضي مع إيران من باب الحاجة لمنع الفتن وتجفيف البيئة المساندة لداعش والقاعدة بادّعاء الدفاع عن مذهب بوجه مذهب، يصير مفهوماً كلام ولي ولي العهد السعودي عن ربط الصراع مع إيران بقضية ظهور الإمام المهدي كحرب مع المذهب الذي يجرّب سحق وحرق مريديه في القطيف والعوامية، حتى لو صارت القاعدة وداعش ميليشيات النظام بوجه بعض من شعبه. – هل يعني هذا أنّ الأميركي يريد حرباً على إيران؟ بالتأكيد هو لا يريدها، لكنه فرح لغرق الخليج في أتون وهجها، فالخليج المذعور هو البقرة الحلوب التي تحدّث عنها دونالد ترامب في حملته الانتخابية وها هو يحلبها بخمسمئة مليار دولار ستسبّب إفلاس المملكة، وبالخليج المستنفر مذهبياً وخطر الفتن الداهم تتقوّى أوراق واشنطن التفاوضية مع إيران، ويجري إبعاد الرياض عن ساحات الانخراط مع طهران كحال سورية والعراق، مع الاكتفاء بالترحيب بعرض السعودية تشكيل قوة احتياط للتدخل فيهما، مرفقة بمرتجع مع الشكر. – إفلاس السعودية لا يزعج واشنطن، والخمسمئة مليار الموعودة لعشر سنوات تعادل وسطياً خمسين مليار دولار سنوياً أيّ زيادة أرقام الموازنة لعام 2017 من 236 الى 286 مليار دولار ورفع العجز من 53 الى 103 مليارات دولار أيّ من نسبة 23 إلى 32 ورفع الدين من 83 مليار دولار إلى 133 مليار دولار، وتدريجاً بإضافة سنوية تجعله يصل إلى 800 مليار نهاية السنوات العشرة أيّ ما يعادل 100 من الناتج الوطني الإجمالي المتوقع وهو الإفلاس عينه. – ثمة طريقة لتأمين المبلغ السنوي للخمسين مليار دولار لصفقات سلمان ترامب تتصل بالتدخل في سوق النفط، والمشكلة هي علاقة كمية الإنتاج بالسعر، فزيادة كمية ثلاثة ملايين برميل يومياً على الإنتاج السعودي فوق الملايين العشرة الحالية، يعني هبوط سعر البرميل إلى خمسين دولاراً، وربما أقلّ، فتغطي قيمة الملايين الثلاثة الإضافية مبلغ الخمسين مليار المطلوبة، على سعر الخمسين دولاراً للبرميل، لكن عائد الملايين العشرة يصير أقلّ بخسمين مليار دولار من المقدّر على السعر الحالي ايّ السبعين دولار للبرميل، والسعي لرفع السعر إلى مئة دولار للبرميل يستدعي تخفيض الكمية إلى ستة ملايين ونصف مليون برميل يومياً، ويصير المليون ونصف المليون برميل مصدر دخل كافٍ لتوفير الخمسين مليار دولار سنوياً، لكن الملايين الخمسة الباقية تصير قيمتها أقلّ بخمسين مليار دولار سنوياً عن المقدّر للسنة الحالية. – اقترح بعض السعوديين حسم الأميركيين للقسط السنوي السعودي من الودائع المجمّدة في أميركا وكان الجواب الأميركي أنّ الودائع مجمّدة بقرار قضائي ويمكن اعتبارها ضماناً للسداد فقط. – الإفلاس السعودي والغرق بالفتن والحرب الأهلية، ورفع منسوب التوتر مع إيران، ورمي الرياض في الحضن «الإسرائيلي» نهائياً لمهمة وظيفية ترتبط بالقلق «الإسرائيلي» من المتغيّرات السورية، هي أهداف أميركية تتزامن مع الحصول على كلّ المال ولإنعاش الاقتصاد الأميركي الراكد، وبيع المصانع التي انتهت فعاليتها الأميركية كما السلاح الأميركي الذي لا يزعج «إسرائيل»، ليكون ما قاله المحافظون الجدد عن السعودية كجائزة ترضية لحروبهم في آسيا سقفاً مستمراً لسنوات مقبلة. قناة السويس في ريف دمشق ! !